Ultrasound Guided Thyroid Biopsies allows the radiologist to sample the cells in the thyroid without surgery. 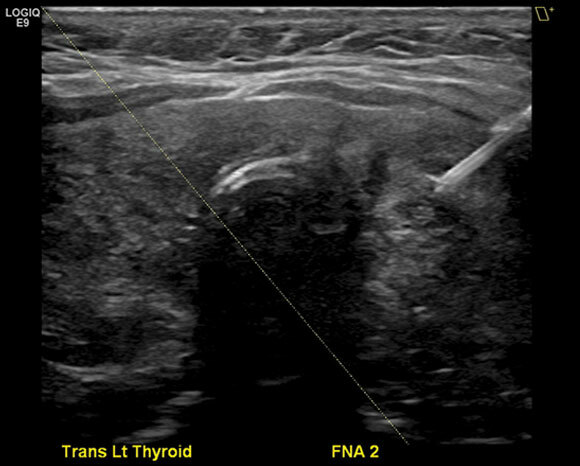 During the Ultrasound Guided Thyroid Biopsy, the patient is made comfortable on the ultrasound table positioned with a pillow under the shoulders, extending the neck. The patient’s neck is cleaned with betadine and a sterile drape is placed over the area. The radiologist inserts a very thin needle into the area being biopsied and a sample of cells and fluid is taken. Typically, three samples are taken from the area. Following the Ultrasound Guided Thyroid Biopsy, the area will be cleaned and a small band aid is applied to the site. Biopsy results typically are available within 24 to 48 hours. In preparation for a thyroid biopsy, patients are required to stop taking the following oral medications five days prior to the procedure: prescription blood thinners (consult personal physician), Advil, Ibuprofen, Aspirin, Vitamin E and Fish Oil.